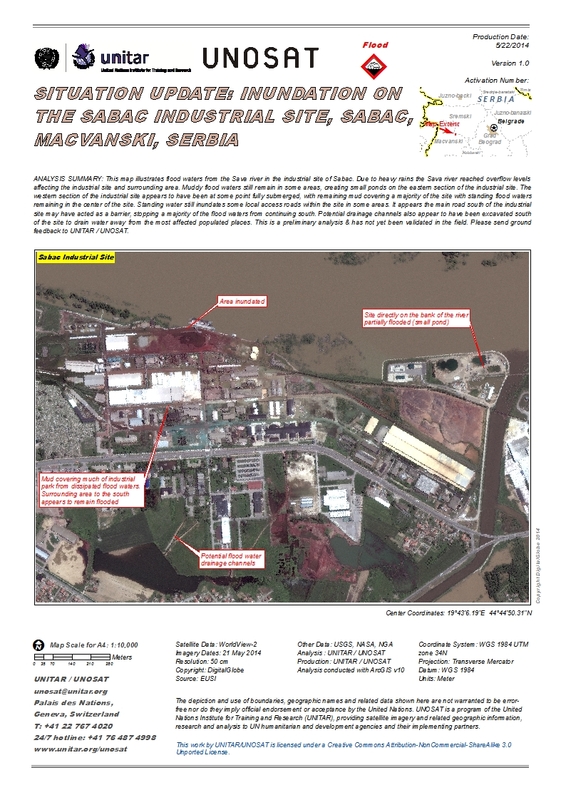 ANALYSIS SUMMARY: This map illustrates flood waters from the Sava river in the industrial site of Sabac. Due to heavy rains the Sava river reached overflow levels affecting the industrial site and surrounding area. Muddy flood waters still remain in some areas, creating small ponds on the eastern section of the industrial site. The western section of the industrial site appears to have been at some point fully submerged, with remaining mud covering a majority of the site with standing flood waters remaining in the center of the site. Standing water still inundates some local access roads within the site in some areas. It appears the main road south of the industrial site may have acted as a barrier, stopping a majority of the flood waters from continuing south. Potential drainage channels also appear to have been excavated south of the site to drain water away from the most affected populated places. This is a preliminary analysis & has not yet been validated in the field. Please send ground feedback to UNITAR / UNOSAT.